Amos was the top perform last week, and now Amos ties for top performer with Nate Silver’s Elo and ESPN’s FPI. Amos went 10-4, having misses of Tennessee, Atlanta, Philadelphia and Minnesota. ESPN’s FPI went 10-4, having misses of Tennessee, Philadelphia, Miami and San Diego. Microsoft’s Bing went 9-5, having misses of Atlanta, NY Jets, Philadelphia, Minnesota and Miami. Nate Silver’s Elo went 10-4, having misses of Atlanta, Philadelphia Minnesota and Miami. Moving on into Week 12 picks, and Thanksgiving weekend, keep a lookout for the Philadelphia at Detroit and Carolina at Dallas games. 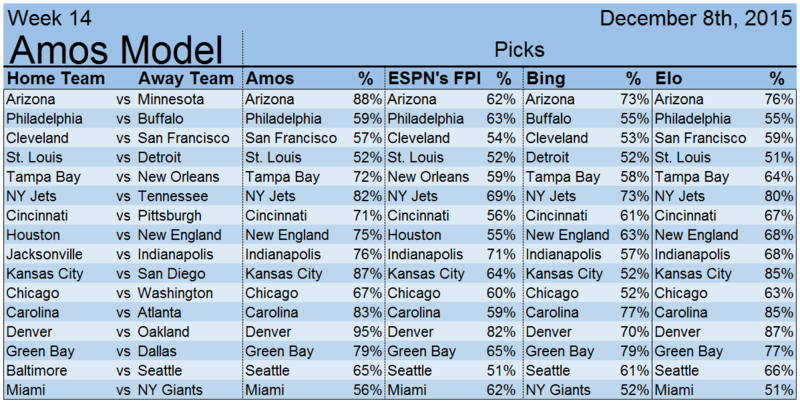 Amos’ notable picks include Philadelphia over Detroit (51%), Carolina over Dallas (58%), Tennessee over Oakland (59%), and NY Jets over Miami (62%). ESPN’s FPI is predicting a slew of upsets this week, favoring Philadelphia over Detroit (50%), Dallas over Carolina (65%), San Diego over Jacksonville, Miami over NY Jets (51%) and Denver over New England (56%). Microsoft Bing’s notable picks include Detroit over Philadelphia (53%), Carolina over Dallas (52%) and NY Jets over Miami (57%) and Cleveland over Baltimore (55%). Nate Silver Elo’s notable picks include Detroit over Philadelphia (52%), Carolina over Dallas (65%) and NY Jets over Miami (62%). Finally, from the performances of each of the teams, Amos has simulated the rest of the season. 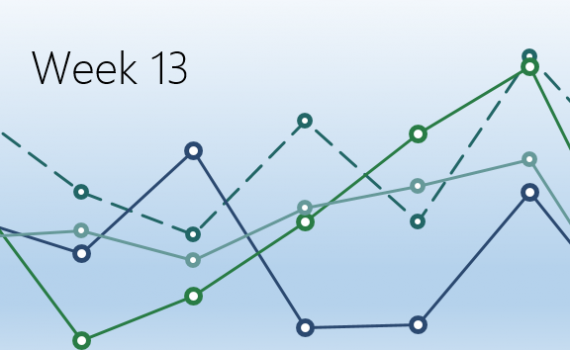 The biggest gainer this week was Jacksonville, not only picking up its win this week, but also adding an additional game throughout the rest of the season. The biggest losers this week are San Diego, San Francisco and Minnesota, all of which lost two games on their record. As of now, Amos is stilling predicting Green Bay to clinch the NFC North. 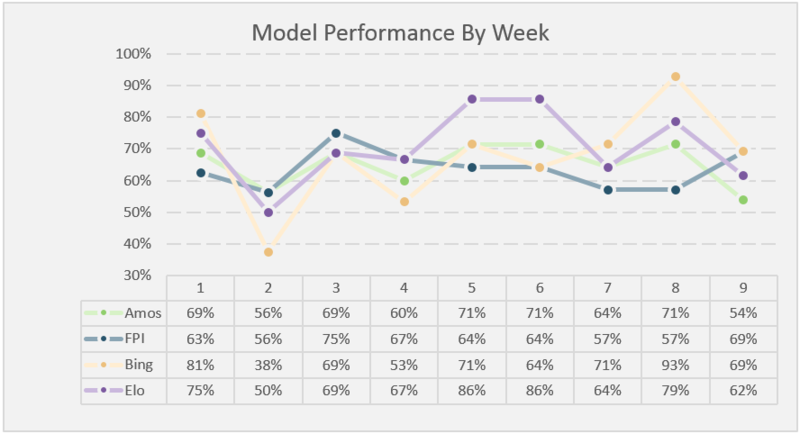 There you have it folks, while a rather underwhelming week for all models, Amos claims its first top performing week. A nasty week for the models. 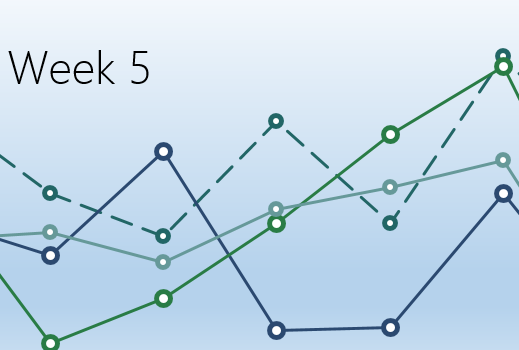 With misses everywhere, none of them were able to make it over 50% this week. Amos went 5-9, having misses of NY Jets, Green Bay, Dallas, St. Louis, Philadelphia, Baltimore, Denver, Seattle and Cincinnati. However, a notable pick that allowed Amos the edge this week was Washington over New Orleans. ESPN’s FPI went 4-10, having misses of NY Jets, Green Bay, Dallas, St. Louis, New Orleans, Philadelphia, Baltimore, Denver, Seattle and Cincinnati. Microsoft’s Bing went 4-10, having misses of NY Jets, Green Bay, St. Louis, New Orleans, Philadelphia, Baltimore, Denver, Seattle and Cincinnati. Microsoft Bing was able to pick up on Tampa Bay’s win and successfully pulled a pick, however had a miss of Oakland. 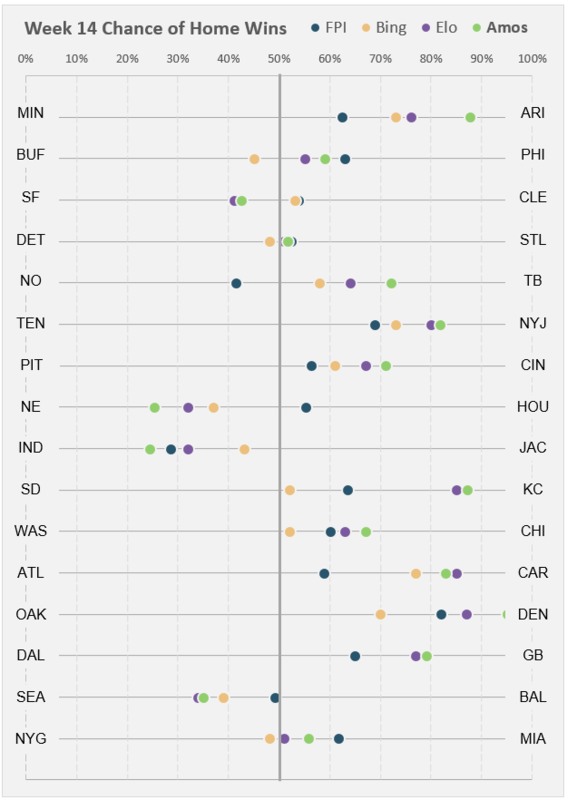 Nate Silver’s Elo went 4-10, having misses of NY Jets, Green Bay, Dallas, St. Louis, New Orleans, Philadelphia, Baltimore, Denver, Seattle and Cincinnati. Moving on to Week 11 picks, there is a lot of variability, but the models are specifically split for the Jacksonville vs Tennessee game. 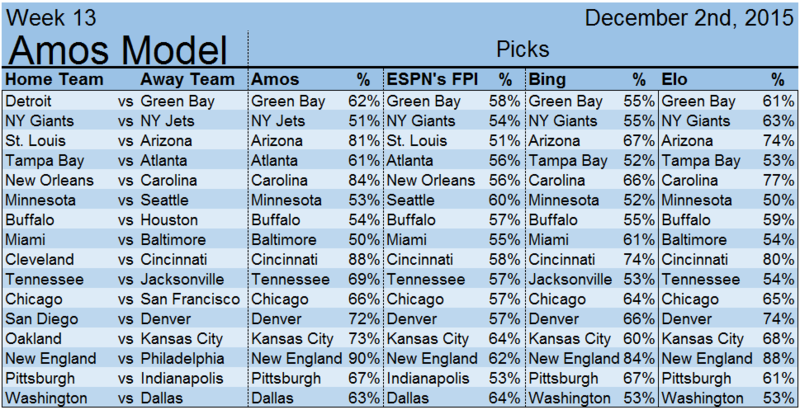 Amos has two spotlight picks, currently favoring Tennessee over Jacksonville (50.4%) and and Dallas over Miami (55%). 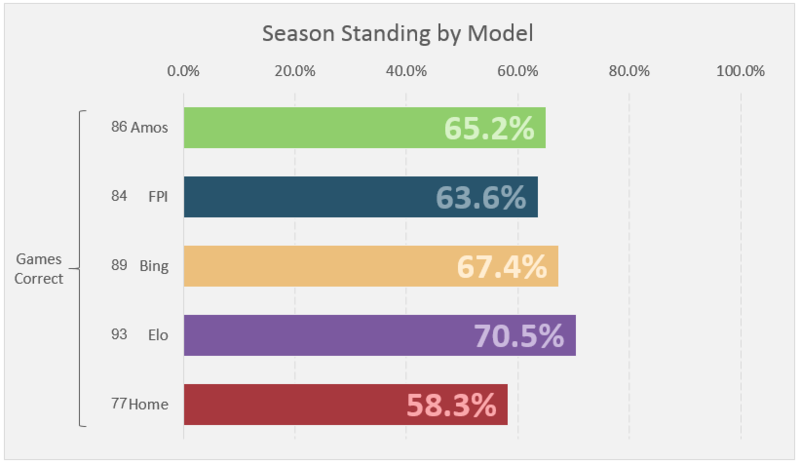 ESPN’s FPI is deviating a lot from the rest of the models, currently favoring Tennessee over Jacksonville (57%), Indianapolis over Atlanta (59%), Green Bay over Minnesota (61%) and San Diego over Kansas City (54%). FPI is currently the only model to believing in Aaron Rodgers to get back on track. Microsoft’s Bing is currently favoring Jacksonville over Tennessee (61%) and NY Jets over Houston (57%). Nate Silver’s Elo only has one that is specifically noteworthy, which is Jacksonville over Tennessee (62%). Finally, from the performances of each of the teams, Amos has simulated the rest of the season. The biggest gainer this week was Tampa Bay, not only picking up its win this week, but also adding an additional 2 games throughout the rest of the season. The biggest losers this week are Baltimore, Dallas, New Orleans, Seattle and St. Louis all of which lost two games on their record. 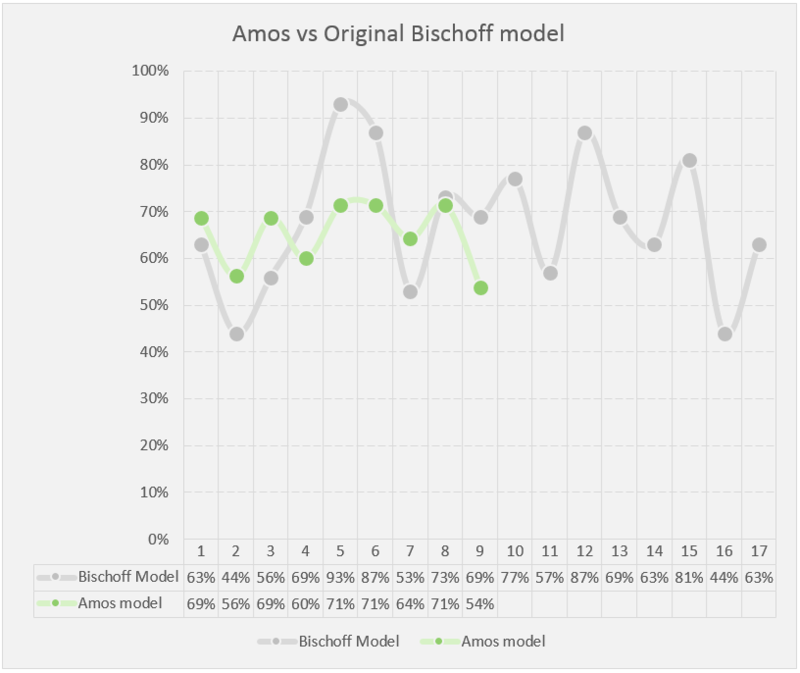 The 2015 NFL season now has 9 weeks under its belt and it’s time to see how Amos has done this season against a broader view of prediction models, as well as how Amos has performed compared to the previous season’s Bischoff model. First, a look at how the Amos model compares with last year’s model. The Bischoff model contained much more volatility up to this week last year. Specifically, having two breakout performances within Week 5 (93%) and 6 (87%), but also deepening to a 44% performance in Week 2. In comparison, Amos has performed much more consistently, not having a performance under 50%. Amos still has ground to cover to prove superiority over the Bischoff model. Let’s look at how Amos’ performance over the season has matched up with its selected peers. 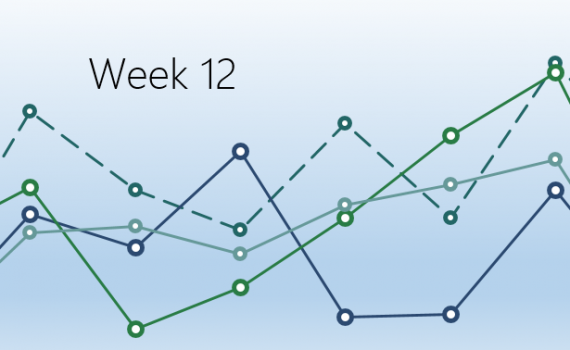 Amos hasn’t had any standout weeks within its peer model group, but that’s also due to Amos’ peers being high performers. Amos can’t boast a week where it has been the top performer, yet its consistency is what has allowed it to remain a top contender. 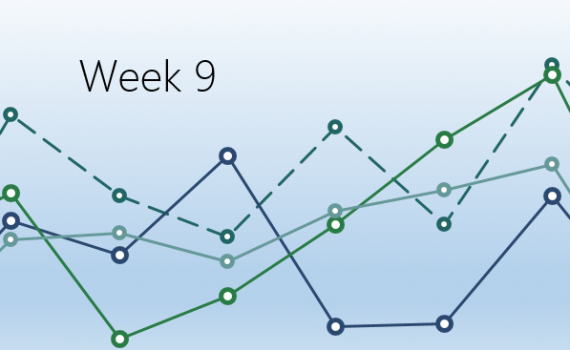 Bing has struggled to having any form of consistency, with an explosive Week 8, reaching 93%, Bing has also stooped to a 38% Week 2. 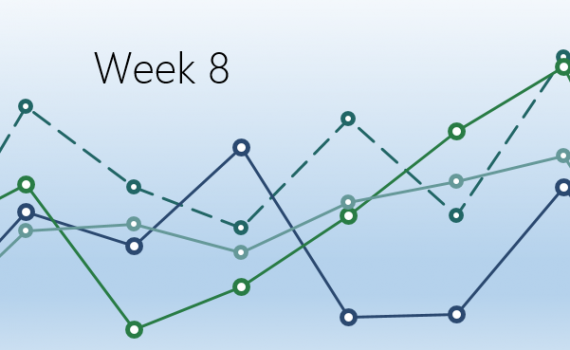 Elo has been a dominant predictive model for the majority of the season, boasting two consecutive 86% performances over Week 5 and Week 6, and is currently in the lead. 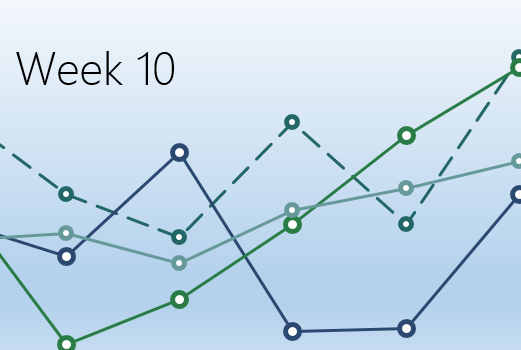 Finally, FPI has performed consistently as well, but has not had any extraordinary weeks yet. How about a broader scope? Amos has proven to be a top contender within the prediction arena, however not strong enough to gain a top 3 stop. Currently sitting in 7th place. 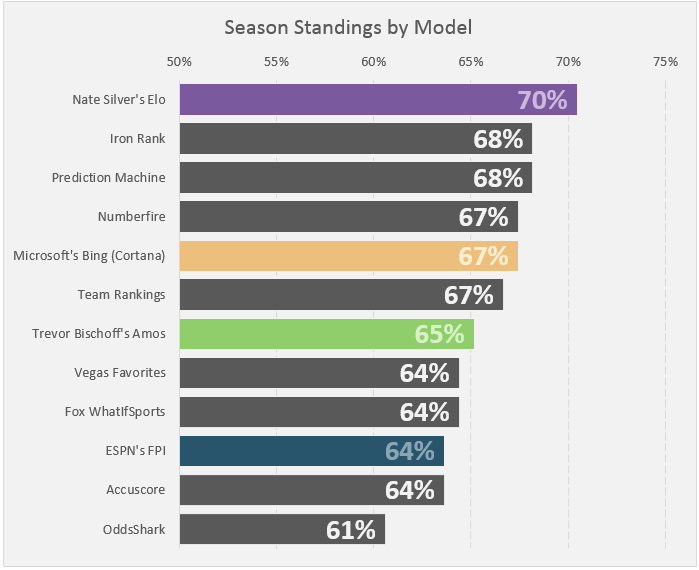 The top performing at mid-season is Nate Silver’ Elo. Finally, probably the most frequent question I get regarding Amos: how does Amos perform if you take it to Vegas? 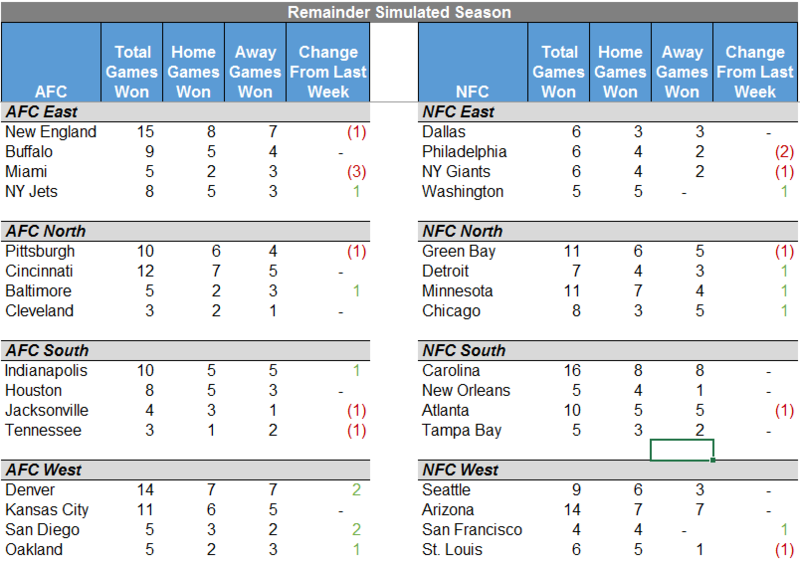 I’ve been pulling moneyline odds throughout the season as Amos’ algorithm finishes computing the probable winners each week. I’ve staged a scenario of a starting account with $1,000 and each of Amos’ predictions are placed with a $100 bet on the moneyline. Amos has done very well with its picks. What’s important in betting is not only getting as many as you can correct, but also predicting key upsets to cash in on the odds. 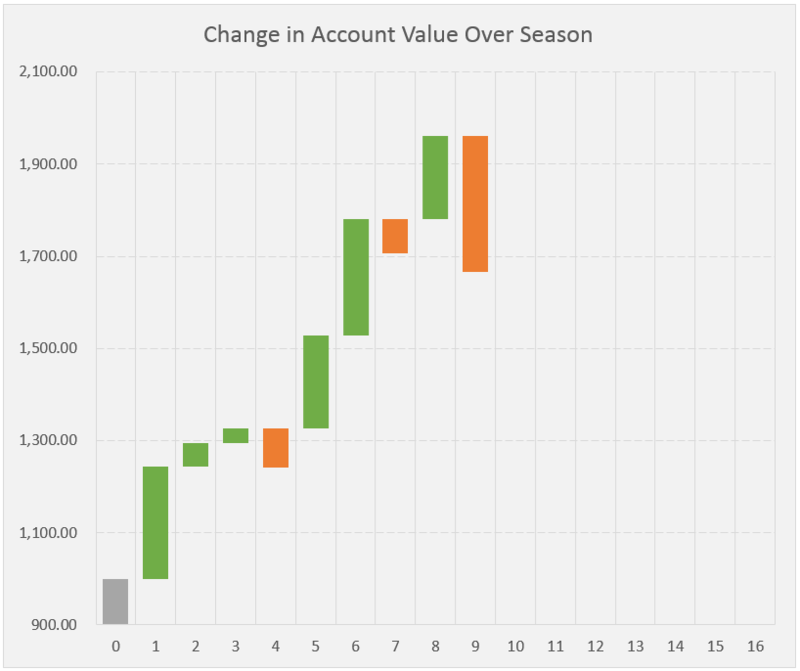 With three weeks of having losses, this account would be up to $1,667.03 on the season. There’s still a whole next half to the season, and it’ll be exciting to see how things develop moving forward. 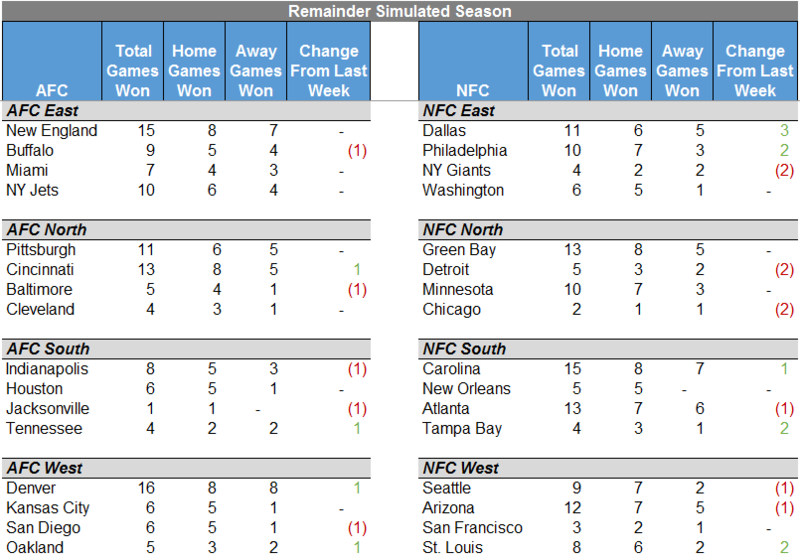 I’ll continue to compile these data points and publish them at the end of the season. 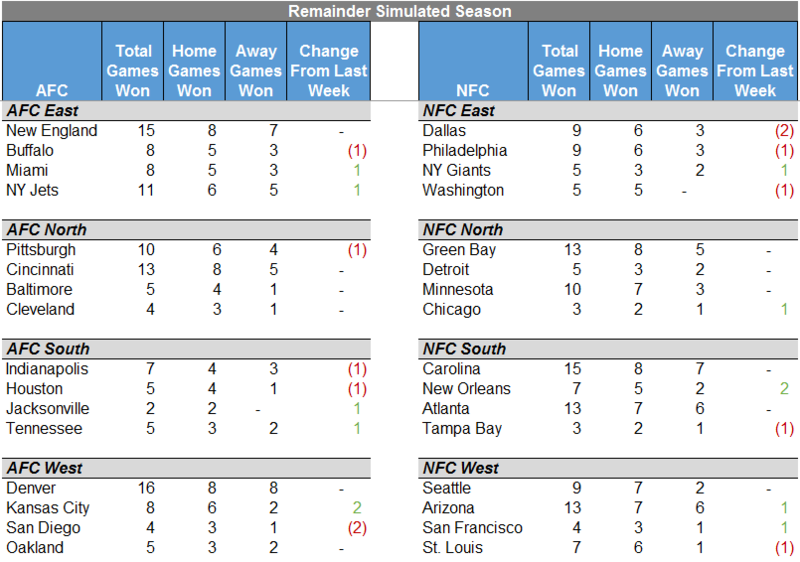 Now for the familiar stats and Week 10 picks. Amos, not having a good week, went 7-6, having misses of Green Bay, New Orleans, Atlanta, Denver, Dallas and San Diego. ESPN’s FPI went 9-4, having misses of Green Bay, New Orleans, Dallas and San Diego. Microsoft’s Bing went 9-4, only having misses of New Orleans, Atlanta, Denver and San Diego. Nate Silver’s Elo went 8-5, having misses of New Orleans, Atlanta, Denver, Dallas and San Diego. 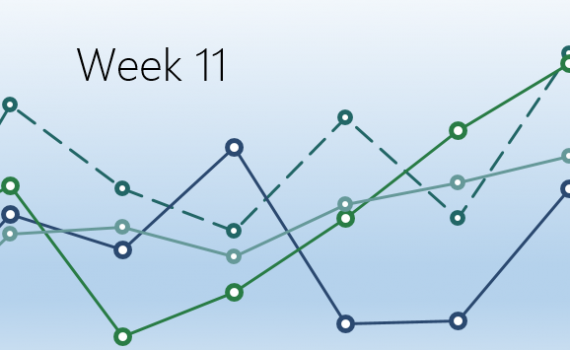 Moving onto Week 10 picks, only three games having differentiating picks – two of which are Bing’s. Amos has the same picks as everyone, besides Washington vs New Orleans, where Amos is favoring Washington (61%). Microsoft’s Bing has two picks differing from the pack, which are Tampa Bay over Dallas (51%) and Oakland over Minnesota (55%). Both being interpreted as very close games. Nate Silver’s Elo and ESPN’s FPI have no differentiating picks this week. Finally, from the performances of each of the teams, Amos has simulated the rest of the season. The biggest gainer this week was Baltimore, who was able to pick up 2 more wins over the season as its remaining opponents have been devalued. 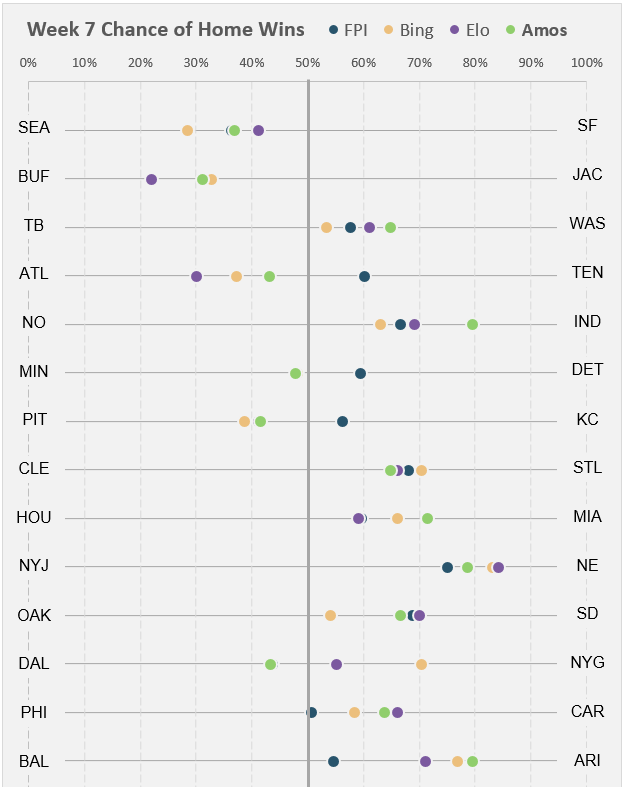 The biggest losers this week are NY Jets, Denver, Green Bay and Tampa Bay, all of which picked up two more loses throughout the remaining season. However, this week something very interesting happened. Denver’s devaluation has now left New England as going the remainder of the season without being beat. Up to this point, Amos only gave Denver the ability to beat New England. With Denver’s performance at Indianapolis, Amos currently does not see Denver winning against New England November 29th, leaving New England with a perfect season. See the results below and each team’s change from the last week. Next week. Holy Bing! Amos drops to third place after explosive performance by Bing. Amos went 10-4, having misses of Atlanta, Pittsburgh, NY Jets and Dallas. ESPN’s FPI went 8-6, having misses of Detroit, Atlanta, Chicago, Pittsburgh, NY Jets and Indianapolis. Microsoft’s Bing went 13-1, only having a miss of Atlanta. 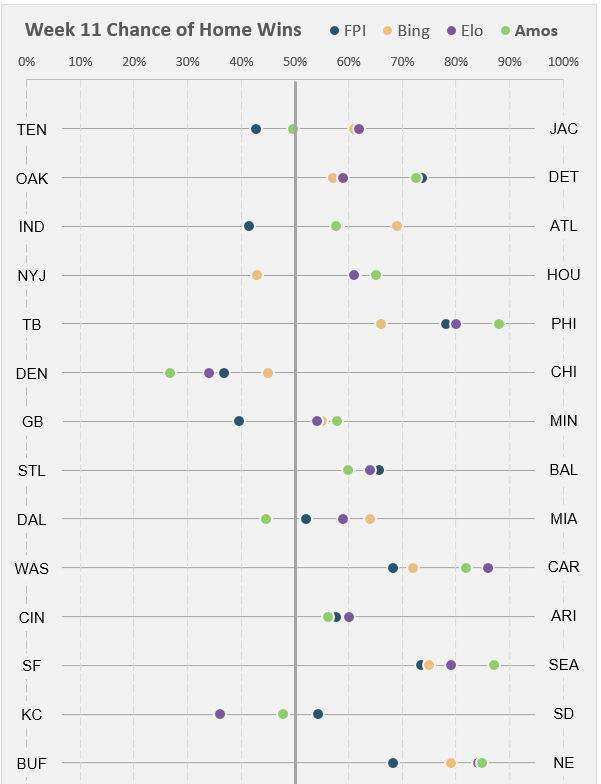 Nate Silver’s Elo went 11-3, having misses of Atlanta, Pittsburgh and NY Jets. 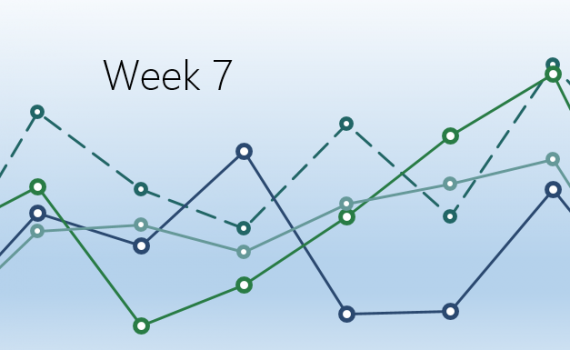 Moving onto Week 9 picks, only four games have models deviating from the rest. The big game this week is Green Bay at Carolina. Amos doesn’t have any surprising picks other than the big toss-up for the week. Green Bay at Carolina, where Amos is favoring Green Bay (58%). ESPN’s FPI has come out with some interesting picks currently favoring San Francisco over Atlanta (54%) and Indianapolis over Denver (58%). Additionally, FPI is siding with Amos and favoring Green Bay over Carolina (58%). Microsoft’s Bing, coming off a nearly perfect week, is currently favoring Carolina over Green Bay (57%). Additionally, Bing is deviating from the rest of the models by taking Philadelphia over Dallas (58%). 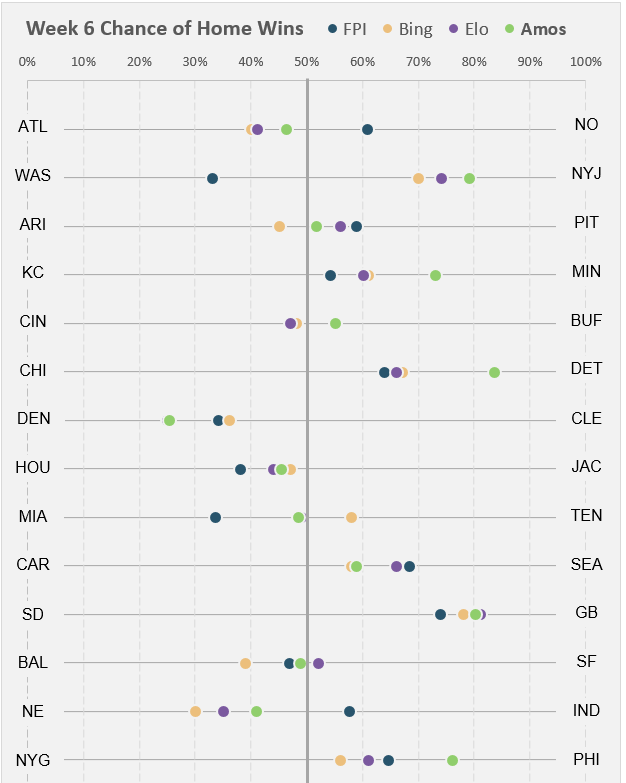 Nate Silver’s Elo is favoring the same teams as Amos, save one: Elo is currently favoring Carolina over Green Bay (55%). Finally, from the performances of each of the teams, Amos has simulated the rest of the season. The big gainer this week is Chicago, who was able to pick up 2 more wins for the seasons after their win over Atlanta. The biggest losers this week are Detroit and San Francisco, who picked up two more loses throughout the remaining season. Next week I will be writing a halftime report, publishing a variety of additional stats and metrics I have been keeping track of for Amos. Amos and Nate Silver’s Elo tie for the week, and Bing regains some lost ground. Amos went 9-5, having misses of Buffalo, Indianapolis, Pittsburgh, San Diego and Dallas. ESPN’s FPI went 8-6, having misses of Buffalo, Tennessee, Indianapolis, Detroit, San Diego and Dallas. Microsoft’s Bing went 10-4, which is only its second time finishing a week above the other models, having misses of Buffalo, Indianapolis, Pittsburgh and San Diego. Nate Silver’s Elo went 9-5, having misses of Buffalo, Indianapolis, New Orleans and San Diego. Unfortunately, Elo did not have a pick for the Minnesota and Detroit game which will be counted against it. Moving onto Week 8 picks, ESPN’s FPI is calling for some upsets. However, the main toss up is Cincinnati vs Pittsburgh this week. Amos’ picks this week are no surprises except Amos continues to have faith and is favoring Dallas by less than 1% (actually 50.008%). ESPN FPI is predicting some upsets this week with favoring Detroit over Kansas City (53%), Chicago over Minnesota (55%), and Indianapolis over Carolina (56%). 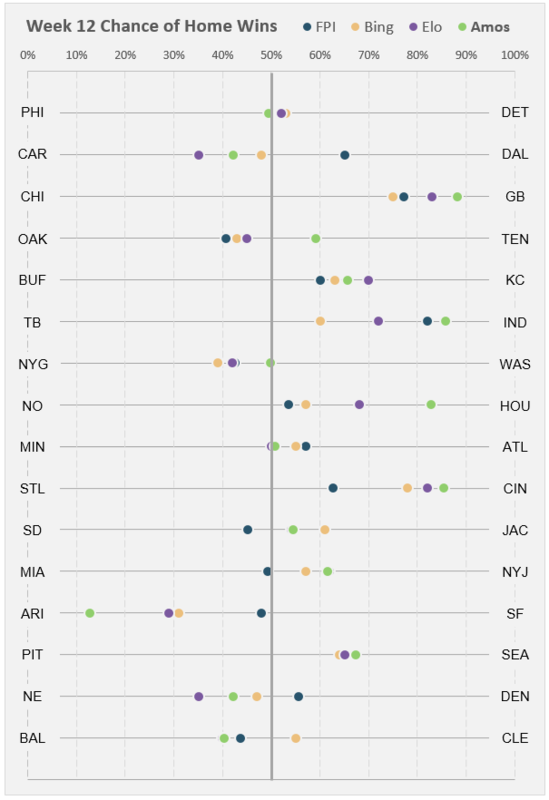 FPI is also on the fence over Dallas vs Seattle, but is leaning slightly to Seattle. Microsoft’s Bing has two deviations from the other models which are Cincinnati over Pittsburgh (52%) and Oakland over NY Jets (53%). Nate Silver’s Elo has the same predictions as Amos and Bing, however Elo, much like Amos, has predicted right at 50% for the Cincinnati at Pittsburgh game. Elo has taken the Pittsburgh pick. Finally, from the performances of each of the teams, Amos has simulated the rest of the season. The big gainer this week is Kansas City, who was able to pick up 2 more wins for the season. The biggest losers this week are Dallas and San Diego, which should not be surprising after the loses this week. 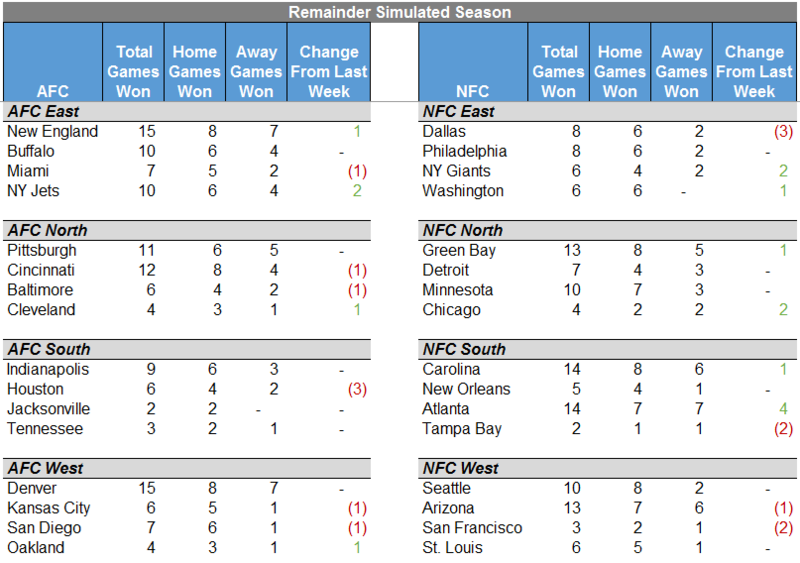 See the results below and each team’s change from the last week. Update: A reader pointed out that Nate Silver’s Elo does indeed have a pick for the Cincinnati at Pittsburgh game. This has been added and updated in all charts and graphs. Update: Bing changed its pick from NY Jets to Oakland. This has been added and updated in all charts and graphs. Amos overtakes FPI for second place and Elo extends its lead 1 more game. Amos went 10-4, having misses of Atlanta, Buffalo, Baltimore and Seattle. A great week for Amos. ESPN’s FPI went 9-5, finding a great pick of New Orleans over Atlanta, but having misses of Washington, Buffalo, Seattle, Baltimore and Indianapolis. Microsoft’s Bing went 9-5, having misses of Atlanta, Seattle and Baltimore, but also having two more notable misses of Arizona and Tennessee, which were deviations from the other models. Nate Silver’s Elo, having another stellar week, went 12-2. 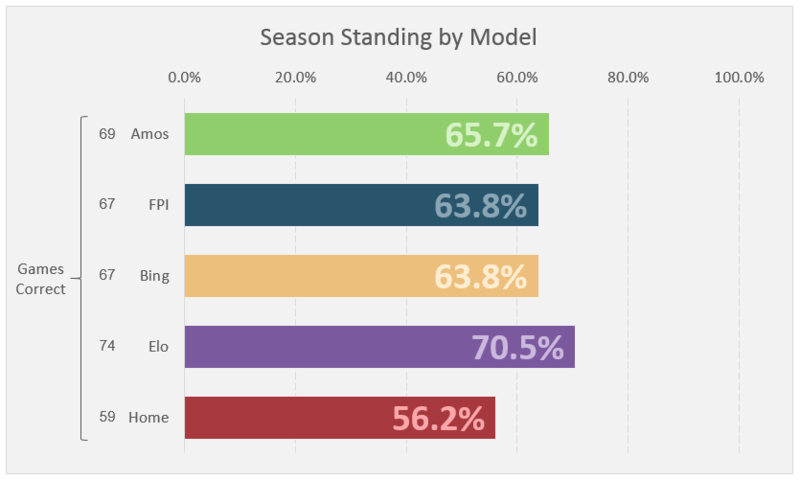 Elo only missed picks of Atlanta and Seattle, pulling off two great picks of Cincinnati and San Francisco against the other models. Moving into Week 7 picks, ESPN’s FPI has the bold predictions for the week while the other three models are at a consensus other than Dallas at NY Giants. 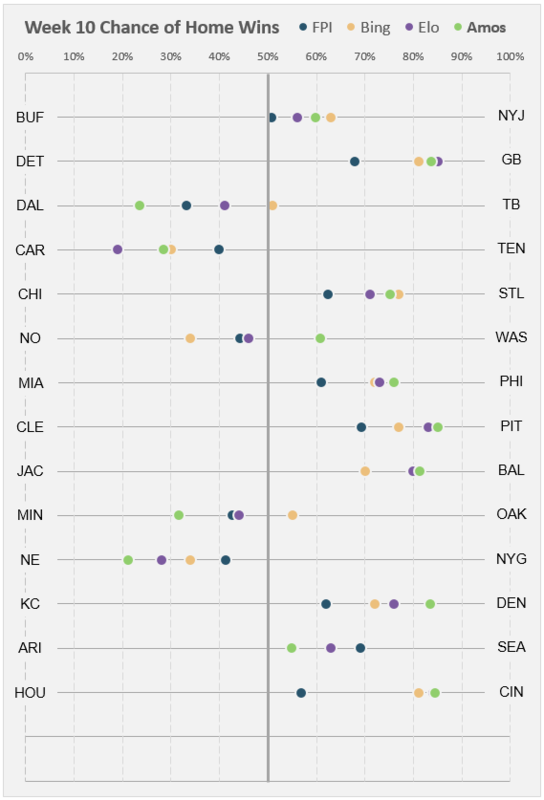 Amos, Microsoft’s Bing and Nate Silver’s Elo all have the same picks, except Elo currently does not have a pick for the Minnesota at Detroit game and is evenly split exactly 50-50. 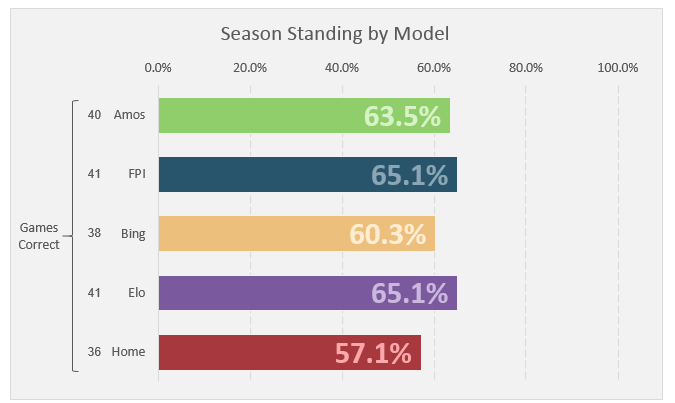 The only deviation occurring between the three models is the Dallas at NY Giants game where Amos and ESPN’s FPI are favoring Dallas meanwhile Microsoft’s Bing and Nate Silver’s Elo are favoring NY Giants. This poses an interesting interpretation as Bing has not been performing well, however Elo has been performing well. This could allow Bing to regain some ground or allow Amos and FPI to get a step closer to Elo. ESPN FPI has three deviations for Week 7. FPI is favoring Tennessee over Atlanta (60%), losing some faith in Atlanta after last week’s loss at New Orleans. Additionally, FPI is favoring Detroit over Minnesota (59%) and Kansas City over Pittsburgh (56%). Finally, from the performances of each of the teams, Amos has simulated the rest of the season. The big gainer this week is Dallas, as Amos has calculated an additional three wins throughout the season as Amos devalues select opponents of theirs, specifically over NY Giants this week which Amos was favoring NY Giants until last night’s game. 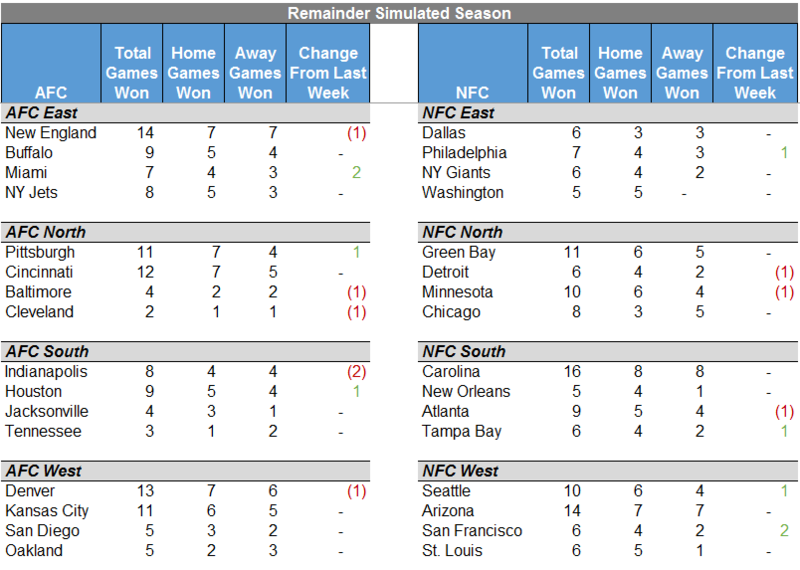 The biggest losers this week are NY Giants, Chicago and Detroit as Amos penalized all three teams two games. Amos comes off a great week, but so do the rest of the models. Amos went 10-4, having misses of Kansas City, Jacksonville, Baltimore, and Dallas. Amos went out on a limb with the Dallas and Jacksonville picks against the other models. Amos was able to pull off an exceptional pick of Pittsburgh over San Diego. ESPN’s FPI went 9-5, having misses of Kansas City, Baltimore, Seattle, Detroit, and San Diego. Microsoft’s Bing went 10-4, having misses of Kansas City, Baltimore, Tennessee and San Diego. 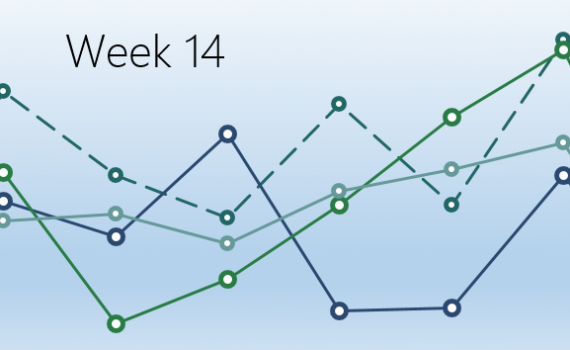 A better week for Bing’s terrible recent performance, but still coming up short in the overall standings. Nate Silver’s Elo went 12-2, an absolutely stellar week, having losses of Kansas City and Baltimore. Elo was also able to predict Pittsburgh over San Diego. 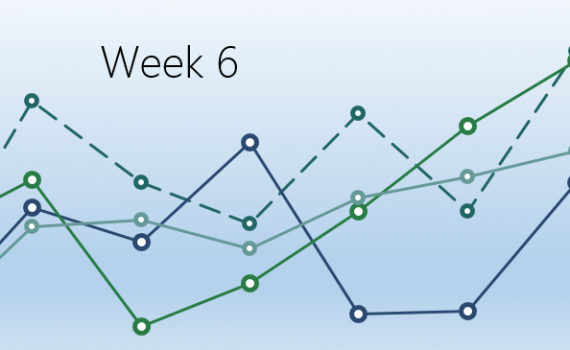 Moving into week 6 picks, the models have decided to throw some daring predictions. Amos hasn’t pulled out any surprising picks this week besides Pittsburgh over Arizona (51.6%). While a bold prediction, all the other models also have Pittsburgh winning. ESPN’s FPI has decided to make a statement, predicting wins of New Orleans over Atlanta (61%), Indianapolis over New England (58%), and Washington over NY Jets (67%). Microsoft’s Bing is joining FPI in predicting New Orleans over Atlanta (53%) and Indianapolis over New England (58%). making two bold predictions by favoring Tennessee over Miami (58%) and Cincinnati over Buffalo (52%). Nate Silver’s Elo also makes two bold predictions. 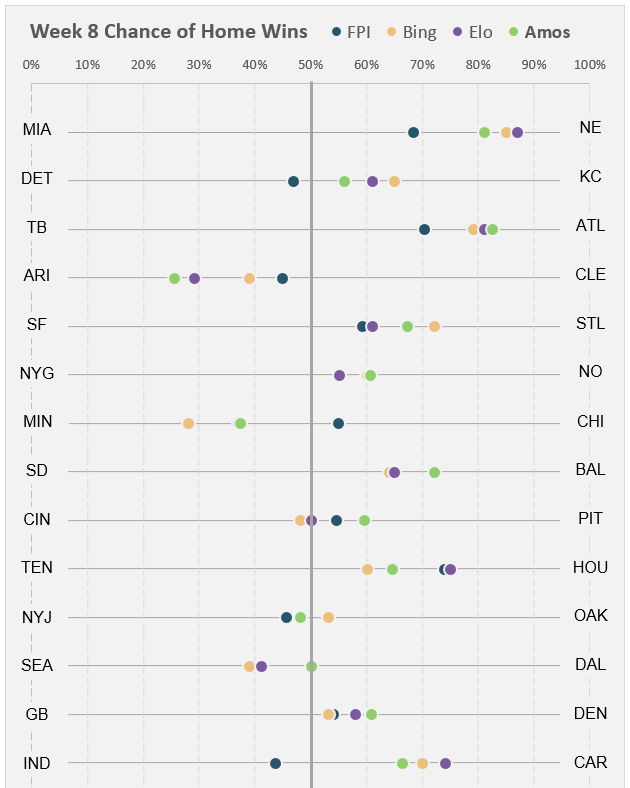 Elo is currently favoring Cincinnati over Seattle (53%) and, confidently, San Francisco over Baltimore (66%) (52%). Finally, from the performances of each of the teams, Amos has simulated the rest of the season. The big gainer this week, again, is Atlanta, as Amos has calculated an additional four games throughout the season as they pulled off a win over Washington. 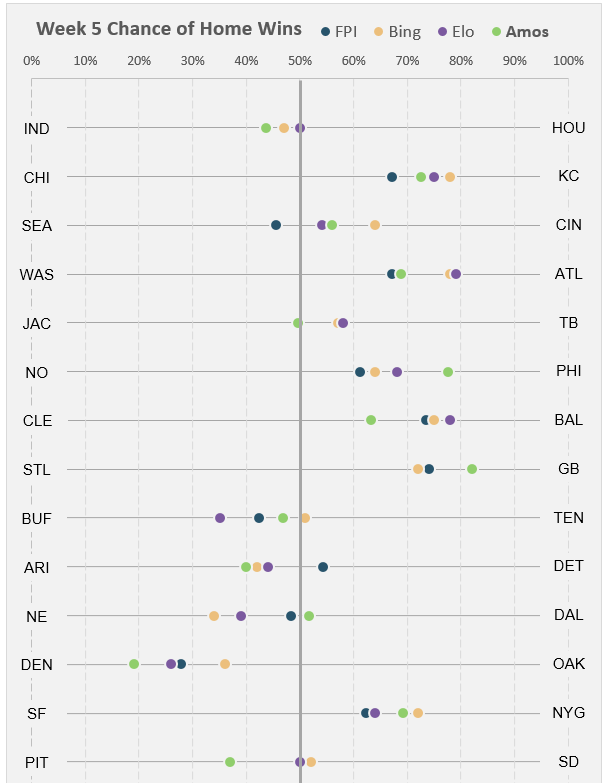 The biggest losers this week are Houston and Dallas, Amos penalizing both teams three games. 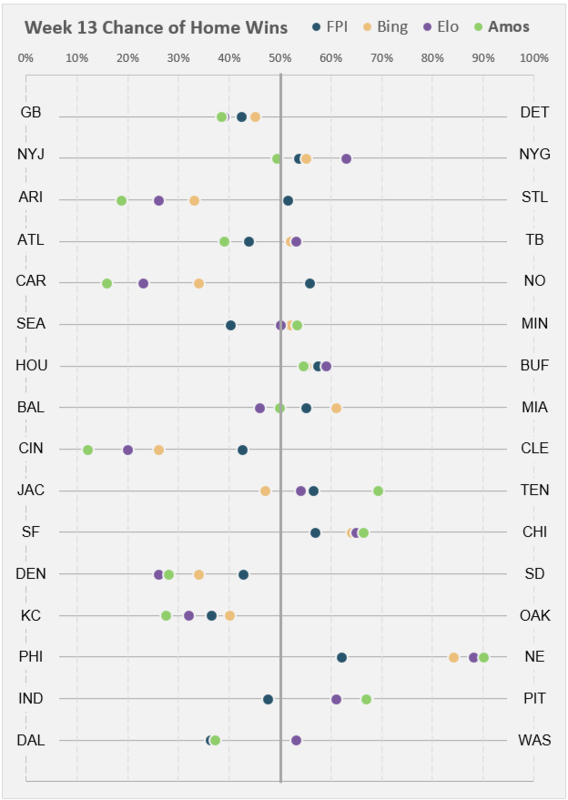 Update: A reader pointed out that Nate Silver’s Elo confidence plot was inverted for the NY Jets vs New Orleans game. This has been corrected and is now accurate in all charts and graphs. Update: Bing changed New Orleans to Atlanta, Indianapolis to New England, Buffalo to Cincinnati, and issued a pick of Tennessee over Miami. This is now accurate in all charts and graphs. Update: A reader pointed out Elo’s probability of San Francisco vs Baltimore changed from 66% to 52%. This is now accurate in all charts and graphs. Update: Bing changed its pick to Arizona (55%) versus Pittsburgh and increased its confidence in Philadelphia to 56%. This is now accurate in all charts and graphs. Amos had an average week, beating out Microsoft’s Bing (Cortana), but falling one behind Nate Silver’s Elo and ESPN’s FPI. Amos went 9-6 (60%). Amos went out on a limb this week and was able to predict wins at Washington and Chicago this week. However, Amos missed its pick of Houston over Atlanta with additional misses on Pittsburgh, Miami, Buffalo, Arizona and Dallas. ESPN’s FPI went 10-5 (67%). 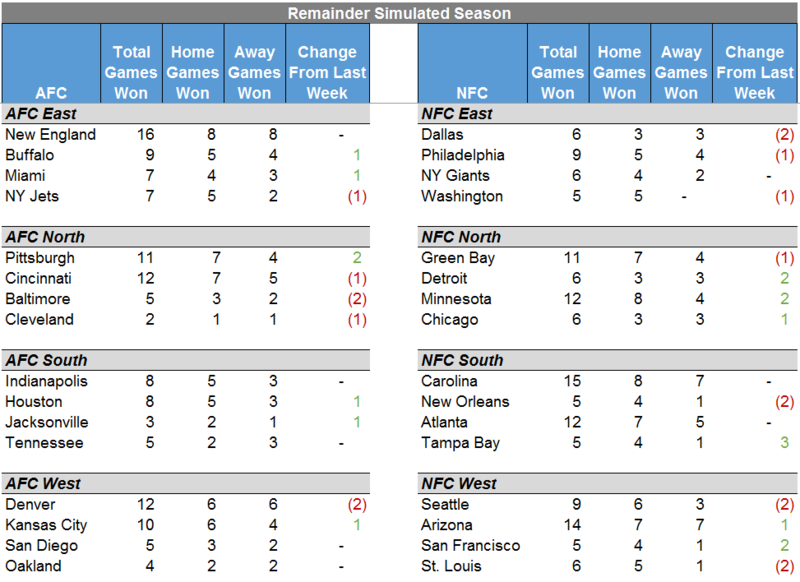 Performing one game over Amos, FPI was able to pick up New Orleans’ advantage of playing at home and Atlanta’s heat wave, however not picking Washington win. Microsoft’s Bing went 8-7 (53%). 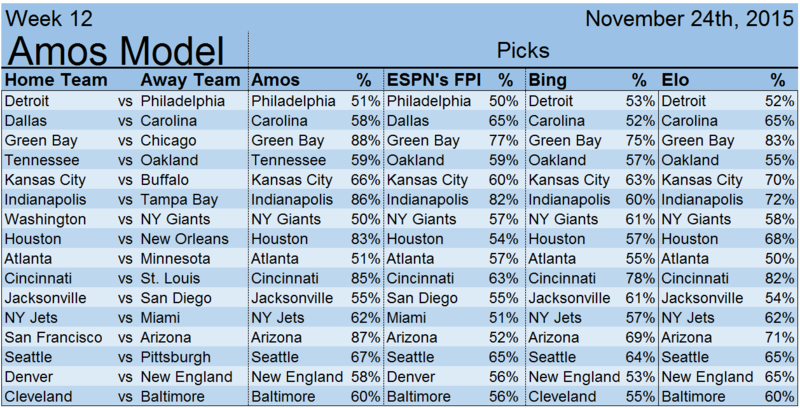 Bing nearly missed half of its picks, most notably Philadelphia and Oakland, but picked up Atlanta which Amos did not. Nate Silver’s Elo went 10-5 (67%). Nate Silver was able to also pull of one game over Amos, which was driven by picks of NY Jets and Atlanta, but not picking Washington’s win. Moving on to Week 5 picks, the models look to differentiate themselves in some key areas. A handful of deviations are present. Amos has a very bold prediction for Week 5, picking Dallas over New England (52%) as New England rolls off its bye week. 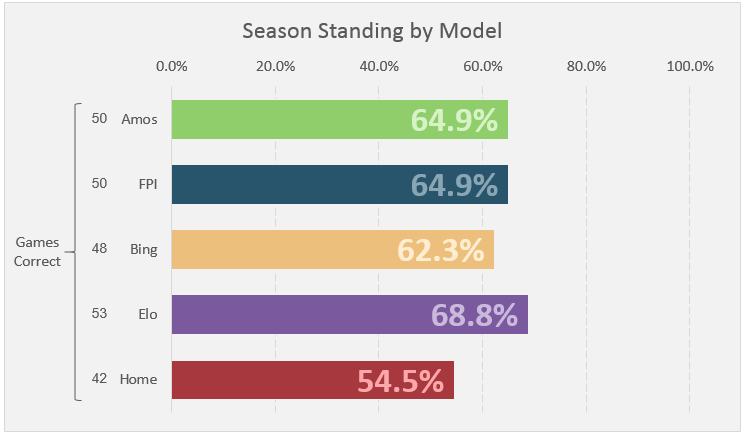 Slightly less bold, Amos is also favoring Jacksonville as they travel to take on Tampa Bay (50.1%) while the rest of the models are favoring Tampa Bay. Additionally, the models are evenly split on the San Diego vs Pittsburgh game; Amos is favoring Pittsburgh (63%). ESPN’s FPI continues to have faith in Seattle as they travel to take on Cincinnati (55%). Additionally, FPI is favoring Detroit over Arizona (59%) and San Diego over Pittsburgh (50.1%). Great chances for FPI to pull away further if the model is correct. Microsoft’s Bing only has one deviation from the rest of the models besides favoring San Diego (52%) in the game against Pittsburgh. Bing is currently favoring Tennessee at home over Buffalo (51%). 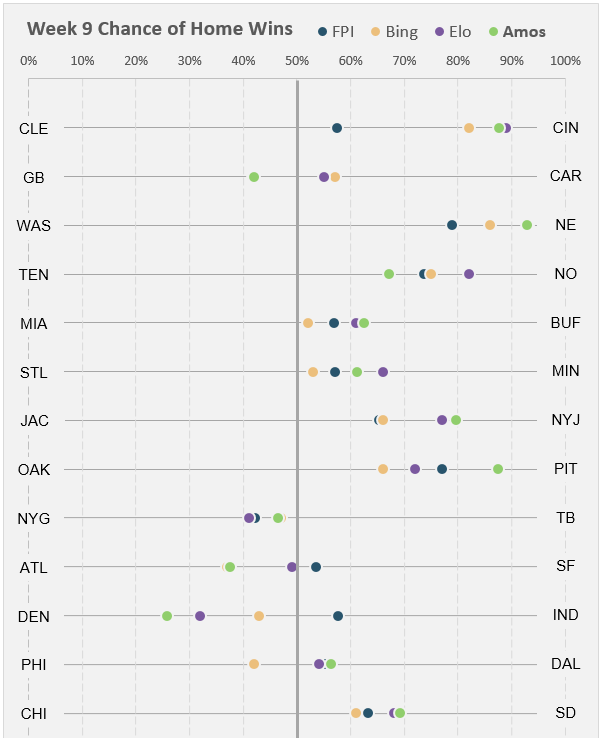 Elo remains relatively mellow entering into Week 5, but joins the ambiguity of the San Diego vs Pittsburgh game by favoring Pittsburgh (50.1%). Finally, from the performances of each of the teams, Amos has simulated the rest of the season. The big gainer this week is Atlanta, as Amos has calculated an additional 3 games throughout the season as a results of their performance against Houston this past week. The biggest loser is Tampa Bay as they struggled with turnovers against Carolina.